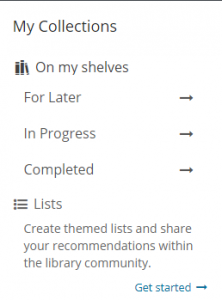 Shelves allow you to keep lists of library items you are currently enjoying, ones you have already read, watched or listened to and those you'd like to borrow later. 1. 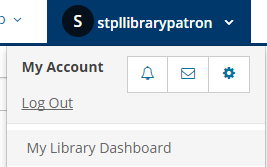 Click on your username in the upper right corner and clink on My Library Dashboard in the dropdown menu. The My Collection menu will be on the left below My Borrowing and My Profile.